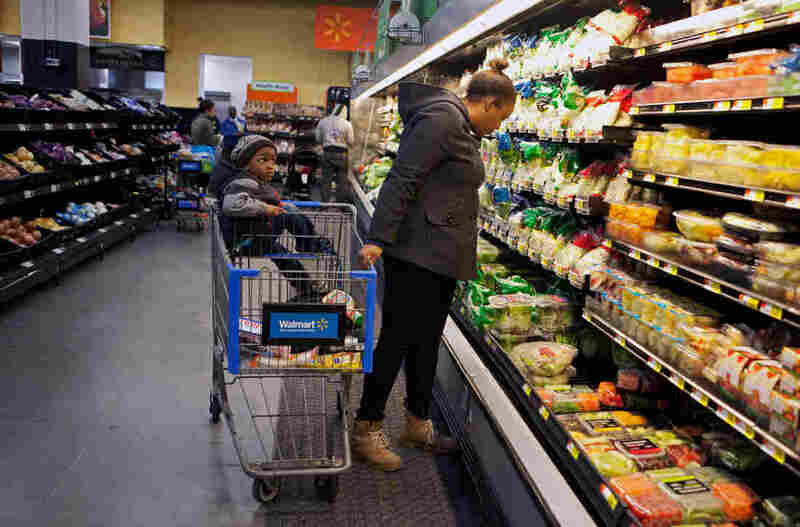 Why Wal-Mart Is Betting Big On Being Your Local Urban Grocer : The Salt Wal-Mart conquered the suburbs, but its future may lie in smaller stores in dense city neighborhoods. And in our grab-and-go times, freshly prepared meals are a big part of its urban strategy. A customer shops for groceries with her son at the Wal-Mart on H Street in Washington, D.C.
"I got a rotissierie chicken, and a card and my prescription," Thomas says. "It's very practical for me because a lot of times, I don't have a lot of time to go shopping. It's convenient for me. I can just grab something and go." We're living in grab-and-go times. Meals planned out days in advance? That's just not happening. "Depending on the version of the survey you look at, 70 to 80 percent of us don't know what we're going to have for dinner at 4 p.m.," says Justin Massa, the founder of a company called Food Genius that analyzes data for the food industry. That's one reason freshly prepared foods are so important to Wal-Mart and its competitors like Target and the big grocery chains. And in densely populated cities like Washington, ready-to-go is even more of a focus. So, for example, while the company might sell lots of iceberg lettuce in some of its stores, "in Washington, D.C., stores, you might see us sell much more of prepared salads or kits, or the full salad bistro bowls, which are really on fire," says Dorn Wenninger, vice president for produce and floral at Wal-Mart U.S.
Back at the Capitol Hill store, Morgan Jones is buying one of those prepared salads, Southwest style with chicken, marked down to $1.99 from $3.98. Yep, he likes the price. NPR compiled data on the locations of Wal-Marts in three American cities. For each of these cities, we used census data to estimate what percentage of the population was within 1 mile of a Wal-Mart. In Washington, D.C., three additional Wal-Marts are under development, allowing us to project the retailer's market growth into the future. Read more about Wal-Mart's urban spread here. "Go to the store, it would cost you $10 in a restaurant," Jones says. "Good deal. Probably my lunch and my dinner. Lot of lettuce and stuff and it's really nice." Jones is studying hospitality at a local community college. His verdict on Wal-Mart: Salads? Nice. Labor practices? Not as nice. "They have a lot of problems," Jones says. "Sometimes they don't treat the cashiers right. They don't treat them right here. They won't talk about it, but they don't treat the people right here sometimes." In this way, Jones is like many Wal-Mart customers. Any qualms they may have about worker pay or Chinese imports or Wal-Mart's obliteration of the mom-and-pop store downtown — they're outweighed by those low prices. "I think it's a good deal," he says. "They need to treat the people a little better. But other than that, it's a good deal." As Wal-Mart seeks a stronghold in big cities, it needs to do more than offer good deals. The company has plenty of competition, and not just from dollar stores and grocery chains. Wal-Mart is battling it out with restaurants — where, according to Massa of Food Genius, Americans are spending half of their food dollars. "If you look in dense urban areas, you will see that kind of split between grocery and restaurant go from roughly 50/50 to, you know, 70/30, 80/20 in favor of restaurants," Massa says. 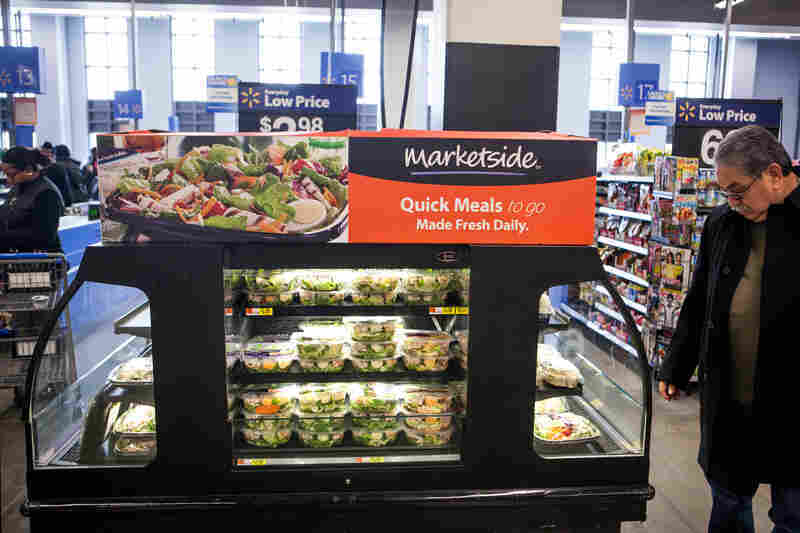 And in big cities, Wal-Mart must cater to a different kind of customer --customers arriving by foot or bus, customers with smaller refrigerators and not much storage space. Customers like Chee-fay Hsieh, a law student at Georgetown. He's buying just what he can carry back home, five minutes away. "Just some salad, some bananas, yogurt, milk, cereal and some Ramen noodles," he says. Wal-Mart has conquered the suburbs and small towns — not the big cities. That's why it has so much riding on someone who hauls his groceries in a backpack instead of an SUV.